BestBuyBattingCages.com provides our customers with top quality professional grade batting cage nets and frames at discount prices. 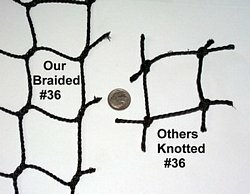 We have complete "net and frame" sets for one low price. We carry nets and screens of all types and sizes. Our packages generally ship within 2 business days. Order securely online or by phone. Our customer service department is open from 8:00 to 5:00 CST, M-F. Call 1-877-431-4487, toll free. 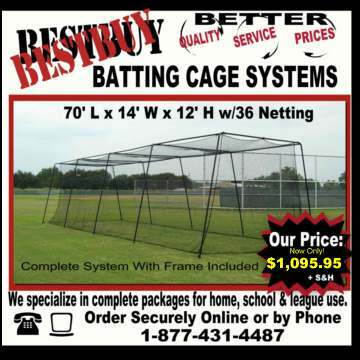 We will gladly help you make the right decision in buying the best setup for your needs.BestBuyBattingCages.com is a division of Nedco Sports, a fully licensed sporting goods company established in 1999. Company hours: 8:00 to 5:00 CST.